63.0 at 18:40 Today's High Ground temp. 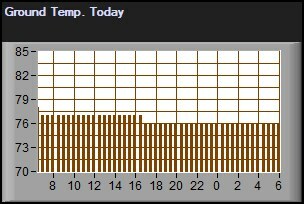 63.0 Time 0:00 Today's Average Ground temp. Today's Greatest Change In Ground temp. 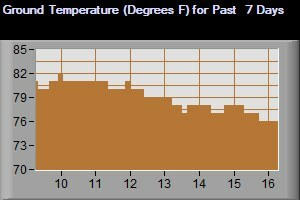 0.00 time 0:00 Today's Least Change In Ground temp. The Ground Temperature changes very slowly generally not more than two or three degrees F unless there has been a cold rain in the fall or a warm rain in the spring.